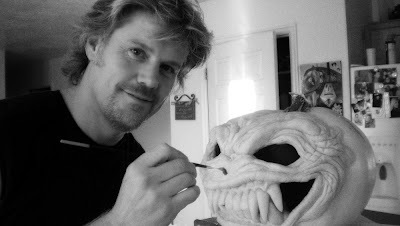 Xtopher's BLOG: Happy Halloween '09!!! We grew our own pumpkins this year, of both the orange and white varieties. 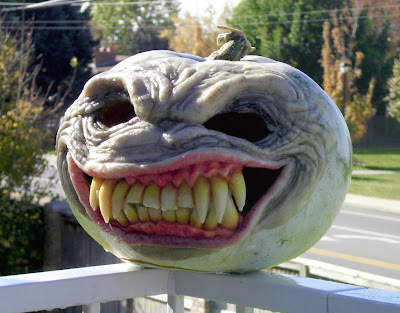 As I was looking over my chosen gourd, the pale hue gave me the idea to cook-up a quick batch of home-made playdough (as mentioned previously on this blog) and sculpt my Jack-O-Lantern this year instead of carving it! (Even the teeth and gums are made of the same stuff.) A quick wash of highly diluted water colors, and a finishing spritz of spray-on cooking oil (for that ultra-slimy look), and my evil goblin/pumpkin was complete! 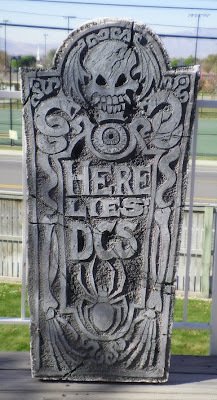 This gravestone was made a few years ago as a family project, with each of my kids making their own out of styrofoam insulation and using a paper stenciling technique I came up with. You tack down a large sheet of cheap roll paper with spray adhesive onto the styrofoam sheet (already cut into the basic shape of your stone). Then you draw out your design, and carefully cut along the lines with an X-acto knife. Remove the 'negative' space, or the areas around your main design elements (like the skull and lettering in my example) ... basically, anything you want to carve 'in' to the stone's surface. Once that's done, lightly spray a solvent-based chemical (like paint remover) over those uncovered areas and watch the evil concoction eat-away at the foam (like Alien blood)! I spray it on a little at a time to get the right depth -- too much looks wrong, and you can't reverse the process. Then you strip-off the remainder of the paper stencil, and paint the thing, spattering the base color (usually gray) with lighter and darker tones to give the whole thing a speckled, ancient stone feel. It's pretty easy & a lot of fun! Besides these gruesome delights, I've been busy working on some cool new projects, including fx work on a music video and some very elaborate motion graphics for a large-scale promo video. More later!